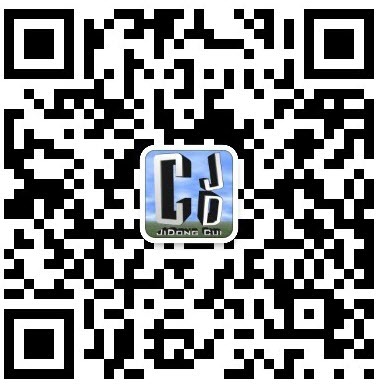 针对PERFORM-3D软件的工字形梁纤维截面剖分小工具。程序通过导入文本参数(.csv)，直接生成纤维截面的参数，并导出PERFORM-3D需要的二进制文件(.PF3CMP)。然后通过PERFORM-3D导入.PF3CMP文件完成繁琐的纤维截面输入工作，节省你的时间。 This program is used for the data input of the “Inelastic Fiber Beam Section” in PERFORM-3D. Through the import of section properties in text format (.csv), the program can generate the fiber section properties automatically. And then, the program export the binary data input file (.PF3CMP) for “Inelastic Fiber Beam Section” which PERFORM-3D can then read to complete the fiber section definition. 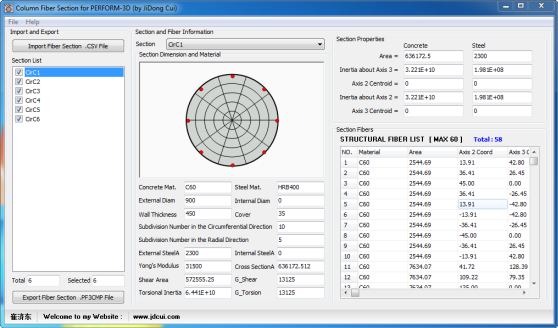 This program will definitely save you time on the input of the structural fibers. 针对PERFORM-3D软件的圆形柱纤维截面剖分小工具。程序通过导入文本参数(.csv)，直接生成纤维截面的参数，并导出PERFORM-3D需要的二进制文件(.PF3CMP)。This program is used for the data input of the “Inelastic Fiber Column Section” in PERFORM-3D. 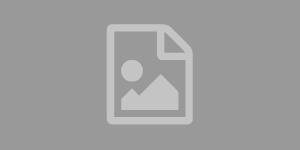 Through the import of section properties in text format (.csv), the program can generate the fiber section properties automatically. 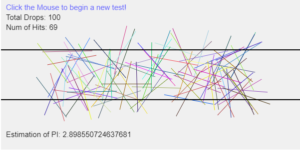 And then, the program export the binary data input file (.PF3CMP) for “Inelastic Fiber Column Section” which PERFORM-3D can then read to complete the fiber section definition. 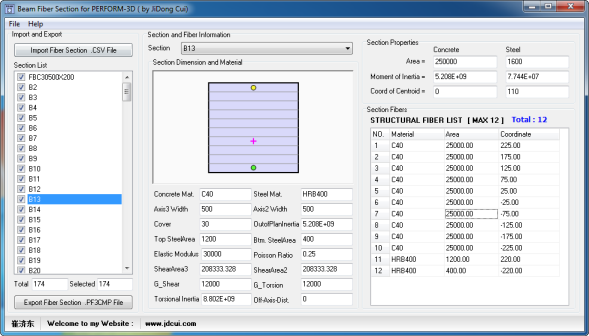 This program will definitely save you time on the input of the structural fibers. 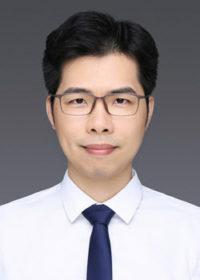 针对PERFORM-3D软件的箱形柱纤维截面剖分小工具。程序通过导入文本参数(.csv)，直接生成纤维截面的参数，并导出PERFORM-3D需要的二进制文件(.PF3CMP)。Through the import of section properties in text format (.csv), the program can generate the fiber section properties automatically. 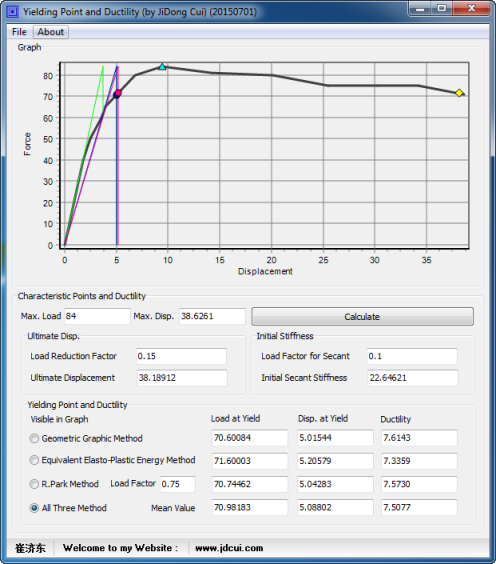 And then, the program export the binary data input file (.PF3CMP) for “Inelastic Fiber Column Section” which PERFORM-3D can then read to complete the fiber section definition. 针对PERFORM-3D软件的RC剪力墙纤维截面剖分小工具。程序通过导入文本参数(.csv)，直接生成纤维截面的参数，并导出PERFORM-3D需要的二进制文件(.PF3CMP)。This program is used for the data input of the “Inelastic Fiber Shear Wall Section” in PERFORM-3D. Through the import of section properties in text format (.csv), the program can generate the fiber section properties automatically. 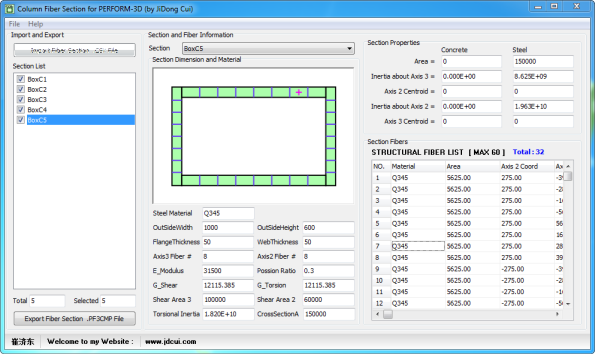 And then, the program export the binary data input file (.PF3CMP) for “Inelastic Fiber Shear Wall Section” which PERFORM-3D can then read to complete the fiber section definition. 针对PERFORM-3D软件的RC矩形柱纤维截面剖分小工具。程序通过导入文本参数(.csv)，直接生成纤维截面的参数，并导出PERFORM-3D需要的二进制文件(.PF3CMP)。Through the import of section properties in text format (.csv), the program can generate the fiber section properties automatically. 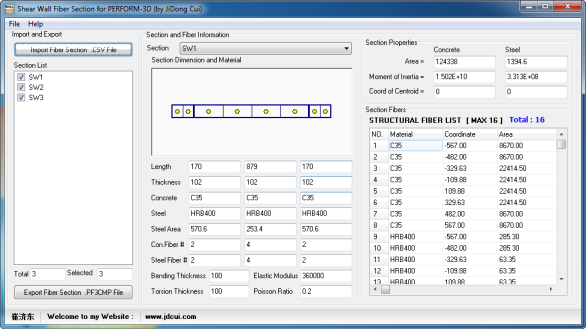 And then, the program export the binary data input file (.PF3CMP) for “Inelastic Fiber Column Section” which PERFORM-3D can then read to complete the fiber section definition. 针对PERFORM-3D软件的RC矩形梁纤维截面剖分小工具。程序通过导入文本参数(.csv)，直接生成纤维截面的参数，并导出PERFORM-3D需要的二进制文件(.PF3CMP)。然后通过PERFORM-3D导入.PF3CMP文件完成繁琐的纤维截面输入工作，节省你的时间。This program is used for the data input of the “Inelastic Fiber Beam Section” in PERFORM-3D.